Running on pavement makes my knees ache, but I’ve found a way to get the calorie-burning benefits of hoofing it without using a “dreadmill”! 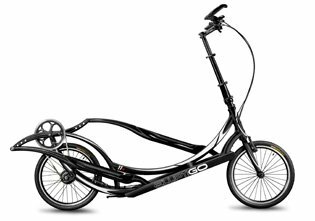 The ElliptiGO ($2,100; elliptigo.com) is a cross between a bicycle and an elliptical that torches close to 600 calories an hour with little impact on your joints. You steer with handlebars, but you stand on the foot platforms to pedal. It took a few minutes and do-overs to get the hang of balancing on it, but once I did, I felt an instant burn in my thighs and glutes. Want to try it yourself? Check out ElliptiGO’s site for opportunities to test one near you.